Where can I get the Paper Crowd model? 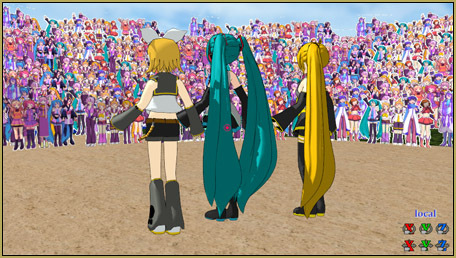 How can I add an audience to my MMD animation? 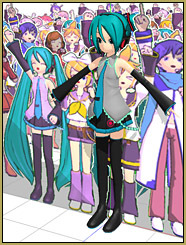 I want an easy way to make an audience or a mob scene for my MMD video. … practically a Mob Scene! 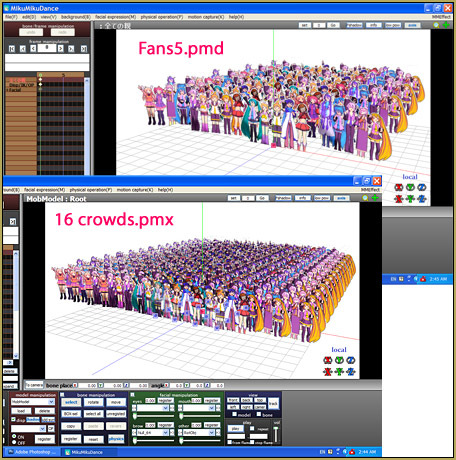 Paper Crowd contains two models… “Fans5” and “16 Crowds”. 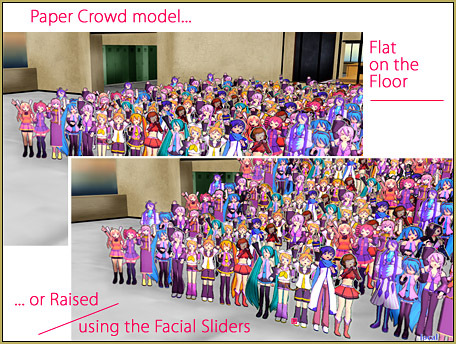 You can control the crowd “manually” by using the facial sliders to lean the crowd left, right, forward or back… and you can move it’s bone with the XYZ rollers. One of the nice adjustments is the “raise” slider that essentially “tilts” the floor under the crowd… so the crowd can look to be standing on the floor or standing on risers/bleachers/stadium seats. 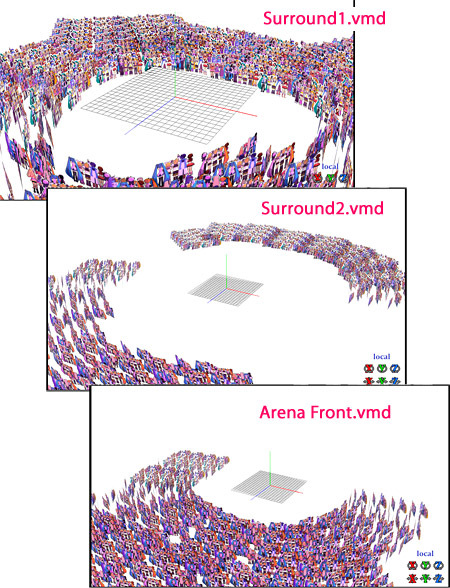 VMD crowd-control files are included! … and the FOURTH one: Wiggle! Yes… “Wiggle” gets the crowd rocking! … maybe a little too fast for MY performances. So I worked to slow it down and minimize that wild motion. I used the Range Select to select ALL FACIAL for the length of my animation. With all those diamonds selected, I used the “Expand” button (by Range Select) and entered a value of 4 so as to stretch the wild motion out to four times its original length… slowing down the motion. I then went to the Edit menu and chose “Multiply of Facial Expression” and entered a value of .3 so as to reduce the total range of the motions. Ahhh… now we are down to a “candles in the wind,” Kumbaya speed… nicer! 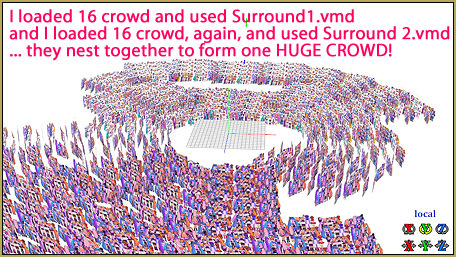 You will notice that the “crowd” isn’t very tall… makes for an instant foreshortening effect allowing your huge crowd to take-up less real estate. Can you customize the crowd? You MAY be able to customize this model so as to use your own “crowd”… or water waves, or gently swaying trees… whatever! … but I was unsuccessful on my first attempt. 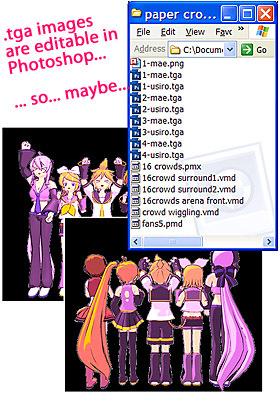 I tried replacing the 2-mae.tga and the 2-usiro.tga images with my own custom image… and the “image” was there, but the cookie-cutter shape was still the original “Miku and the gang” outline shape. … I didn’t explore the puzzle beyond that little test, but perhaps with some study of those PMD/PMX files using PMDE, a solution could be found. Yagakoro on Deviant Art is making the Paper Crowd download available from his pages. Yagakoro says he does not know the original creator but wanted to share the model. There is no ReadMe in that model’s folder… who knows where it came from… but it is fun and easy to use.